The 3.0l V6 TDI engine was developed by Audi (a member of the Volkswagen Group) and introduced in 2004 as the new engine in the Audi D3 A8. The 3.0 TDI engine aroused admiration from journalists and clients who drew attention to fantastic dynamic characteristics.The new engine was installed later in Volkswagen premium models such as the Volkswagen Phaeton and Touareg. This engine was designed from scratch and had nothing familiar with the 2.5 V6 TDI. The 3.0 V6 TDI provides fantastic performance and consumes significantly less fuel than the 2.5 TDI. The engine is built around the cylinder block, which has a 90° V angle and manufactured from compacted graphite iron named CGI-450. This material provides a weight saving of 5 - 10 % in comparison with gray cast iron. The forged, tempered steel crankshaft seats on four main bearings in a gray cast iron bearing frame bolted into the crankcase. The engine has two cylinder heads made of aluminum alloy. These heads have a cross-flow design, four valves per cylinder (two intake and two exhaust valves, 24 valves total,), two camshafts, and roller rocker fingers with hydraulic valve clearance compensation. The exhaust camshafts are linked with intake camshaft via spur gear. The engine has complex roller chains system of the intake camshafts drive. There are four simplex roller chains. The intake manifolds are fitted with continuously variable swirl flaps. The swirl flaps are closed when the engine is idling and at low engine speeds, and are open when the engine is started, in limp-home mode and at full throttle. The engine equipped with one BorgWarner variable geometry turbocharger (VGT) with electric boost control and two parallel side-mounted intercoolers for better cooling and compact design. 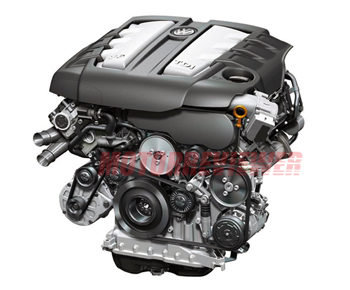 The 3.0l V6 TDI engine has Common Rail (CR) fuel injection system, piezo-controlled seven-hole injectors. All engines are fitted with water-cooled exhaust gas recirculation (EGR), catalytic converter and diesel particulate filter (DPF) for low exhaust emissions. Bosch EDC16 electronic engine control unit manages the engine operation. Most TDI representatives with the number of cylinders more than 6, for example, 4.2 TDI or 6.0 TDI (except V10), were obtained by increasing the number of cylinders of the 3.0 V6 TDI engine. LongLife (QG0, QG2, QG3) - 505.01. LongLife (QG1) - 507.00. Oil 5W30 or 5W-40. The technically sophisticated 3.0 TDI requires a lot of effort and money for any repair. Based on consumer reports, unfortunately, the 3.0 TDI V6 is almost unable to pass 200,000 miles without an overhaul. Often serious problems begin to appear after only 100,000 miles. The timing chain tensioner is the weak point of this engine. Its breakage causes grinding when the engine starts. The first 3.0 TDI was equipped with piezoelectric injectors, which quickly went out of order. They provided a shortage of fuel supplied to the cylinders. As a result, a reduced fuel mixture led to an increase in temperature and a pistons burnout. BKN - 204 hp (150 kW)/3,500 rpm; 332 lb ft (450Nm)/1,500 rpm. Audi A4 (B7) engine. BUN - 211 hp (155 kW) version for Audi Q7 and Volkswagen Touareg. BMK - 224 hp (165 kW)/4,200 rpm; 369 lb ft (500Nm)/2,000 rpm. Application: Audi A6 (C6), Volkswagen Phaeton and Volkswagen Touareg by BKS id. DDXC - 224 hp (165 kW)/4,500 rpm; 406 lb ft (550Nm)/1,500 rpm. Volkswagen Amarok 3.0 TDI engine. ASB - 232 hp (171 kW)/4,000 rpm; 369 lb ft (500Nm)/1,500 rpm or 332 lb ft (450Nm)/1,400 rpm. You can find this version under a hood of Audi A8(D3), A6 (C6), A4 (B7). This engine also was installed in the Audi Q7 (BUG engine). CAP, CCW, CDY, CASA, CARA - 239 hp (176 kW)/4,000 rpm; 369 lb ft (500Nm)/1,500 rpm. Application: Audi A4 (B7, B8), Audi A5, Audi A6 (C6), Audi Q5, Audi Q7, Porsche Cayenne, Volkswagen Touareg.